Has the Government "pared back" what was promised to Magdalene survivors? A number of organisations have called on the government to implement all of the recommendations in the Quirke report. THE GOVERNMENT HAS been accused of paring back what was promised to survivors of the Magdalene Laundries. Justice for Magdalenes Research (JFMR), the National Women’s Council of Ireland, the Irish Council for Civil Liberties (ICCL) and Amnesty International (Ireland) have come together today to call on the government to implement all of Mr Justice John Quirke’s recommendations for a Magdalene restorative justice scheme. 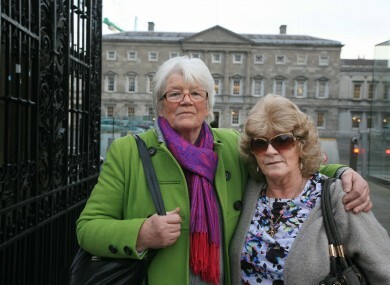 Taoiseach Enda Kenny apologised to Magdalene survivors on 19 February 2013. Criticising the Redress for Women Resident in Certain Institutions Bill 2014, Maeve O’Rourke of JFMR described it as ”an obvious and unacceptable paring back of what the government promised as part of the women’s redress package”. She said that the Bill “promises little more than the regular medical card, which most of the women already have”. The groups said that the women had a legitimate expectation of receiving a number of services, including private GP services, chiropody services, counselling, dedicated liaison officers, and private physiotherapy services, which are omitted from the bill. They also said that there is no commitment to provide a physical card to the Magdalene women, such as the HAA card. They also said that the government has failed to implement fully Judge Quirke’s recommendation regarding the State Contributory Pension, regarding back-dating of pension payments to the women’s retirement age. In addition, they raised concerns about why the Government is not providing for the appointment of care representatives. The women who have received their lump sum compensation and pensions have promised not to sue the State in exchange for the full redress package recommended by Judge Quirke. But she said these waivers are “on shaky ground” over their issues with the legislation. Claire McGettrick of JFMR brought up the issue of Judge Quirke’s recommendation to extend the Nursing Homes Support Scheme Act 2009 to Magdalene women who lack full capacity. “It is imperative that legislation is introduced immediately to protect women in institutionalised settings, to provide independent advocates and ensure that their interests are protected,” she said. Orla O’Connor of NWCI described the Bill as currently proposed as “a further denial of the rights of women survivors of the Magdalene laundries”. The Justice Department told TheJournal.ie that all of Judge Quirke’s recommendations were accepted, in principle, by Government in June. 2 require legislation which is near finalisation. 495 applicants have already received their lump sum payments at a cost of €18m. In addition to the lump sum, each woman is entitled to a top up payment. “The Department of Social Protection established a separate scheme to facilitate this and payments are being processed on a phased basis. The Government decided that these payments would be backdated to August 2013,” said the Department. Judge Quirke recommended that the women should have access to an enhanced medical card, and recommended that legislation should be introduced to give effect to this recommendation. “The legislation was published in December 2014 and is expected to have a speedy progress through the Oireachtas,” said the Department. Under this legislation the Magdalene women will receive an enhanced medical card, as well as certain services free of charge. The Bill also provides that these women will not be required to pay the statutory charge for public acute hospital in-patient services and that the ex-gratia payments being made will not be included in the financial assessment of means under the Nursing Homes Support Scheme Act 2009. On the issue of lacking capacity, the Department said that “legislation is to be introduced to cater for cases where the applicant is found to lack capacity but has not been made a ward of court or there is no enduring power of attorney”. This is called the Assisted Decision Making (Capacity) Bill, and provides for the appointment of a person by a court to act on behalf of the applicant in regard to their financial affairs. The Bill is awaiting committee stage in the Dáil and it is expected to be enacted in the first half of 2015. Email “Has the Government "pared back" what was promised to Magdalene survivors?”. Feedback on “Has the Government "pared back" what was promised to Magdalene survivors?”.